Hard water stains are stains left behind by hard water. But what is hard water? Hard water is water with a high mineral content. 9 out of 10 homes have some hard water content. Hard water is actually quite harmless, but the visual effects can be quite displeasing. It usually appears as white crusty gunk. 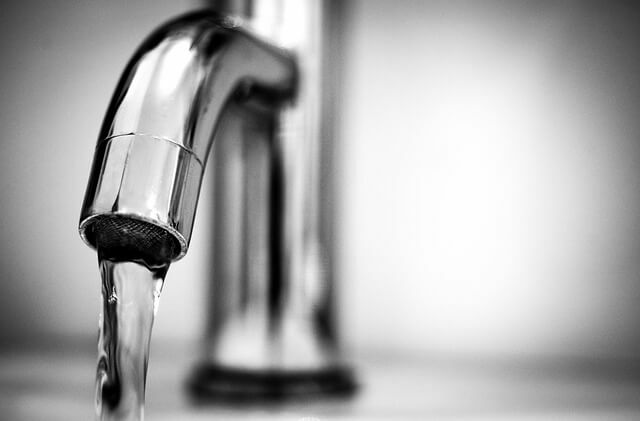 Hard water stains have several different names (some of which correspond to certain affected areas of the home), including: hard water deposits, mineral deposits, lime scale, and mineral build-up. Despite the name “hard water stains”, it’s actually not that hard to remove them! There’s one simple, easy, cheap and effective method for removing hard water stains: white vinegar. For scaly faucets or shower heads, just soak them in vinegar, and the stains are gone! For hard water bathroom stains, just spray some undiluted vinegar on them. You may have some hard water stains that are too tough to simply wipe away with vinegar. In this case, you’ll just need a bit more patience. It doesn’t matter how long the stains have been there; this method should always work regardless. There isn’t much scrubbing involved with this method. The vinegar will do most of the work. Leave the rag for a minimum of one hour. Add more vinegar to the rag to keep it wet if necessary. When the gunk is gone or loosened up enough, use another rag to clean and wipe away the residue. Household chemical cleaners can still do the job, but using white vinegar is much cheaper and better for the environment. Be careful with abrasive cleaners, as they can scratch the surface of your plumbing fixtures, bathtub and sink. If you have a commercial cleaner lying around and want to use that, make sure it contains sequestrants such as: hydroxyacetic, phosphoric, or hydrochloric acids. These acids will capture and erase the minerals in the hard water stains. That’s all you need to know! You are now armed and ready to keep your kitchen and bathroom squeaky clean and stain free!